With Theresa May placing mental health at the top of her agenda, the fight to end the stigma that still surrounds talking about the subject in work is receiving more attention. More and more companies are implementing wellbeing programs, but there is still work to do. levels rise, not everyone yet has the safety-nets in place to deal with the pressure. 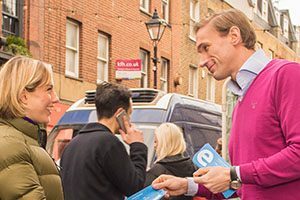 HRreview spoke to TV’s Dr Christian Jessen about the best ways to improve health at work and the battle to ensure mental wellbeing for all. Why do you think it is important that Britons take their full holiday allocation? Holidays are important. If you work hard then you need to give your body and mind time to relax and recover, so you feel fresh and able to apply yourself to more challenges. What place does HR have in this to ensure holiday allowance is used to its full potential? Many people feel guilty about taking time off and this is ingrained in the work ethic of many companies. I’d like to see HR changing this and encouraging people to take enjoyable, restful holidays without worrying they will miss out on opportunities at work. This will mean they get some proper time off and productivity and performance will undoubtedly improve when they return. Asides from holiday allowance, what other advice would you give to employees to improve their wellbeing? Along with taking holidays comes getting enough rest and sleep during the working week. Few of us sleep really well and helping people to improve the quality of their sleep will reap benefits for their work. Technology is one of the great destroyers of a good night’s sleep and encouraging people to have a strict technology switch off time (without feeling guilty!) would be a good start. Do you think that holiday days improve mental health as well as physical health? Exhaustion and stress are serious risk factors for many different health problems. Interventions, like holidays, that can help to reduce these will definitely help people to cope better, but remember that some professional medical input may be needed (and encouraged) too. It may sound odd but most of us have forgotten how to simply ‘do nothing.’ Learning how to switch off is an important skill that is vital for our overall health. ACAS last year reported that sickness absence cost the UK economy 8.4 billion a year. Do you think that by pushing holiday allowance that businesses will be able to lower this cost? You can’t stop people getting ill unfortunately. But you can change the way they approach illness. Taking a sick day at the start of an illness, rather than ‘valiantly’ struggling on into work will mean the overall length of time that person is ill for will probably be shorter. Holidays and appropriate rest will also help. Changing attitudes to illness, including allowing people to talk about their problems and so make them feel more supported can make a huge difference to the severity and duration of the problem. It will also mean people, especially men, will be more likely to seek help rather than covering up and ignoring underlying issues. Do you think there is a benefit to introducing stress awareness training at work? Absolutely! We all think we can cope with stress and we all suffer because of this. Some stress is good and can keep us on our toes, too much stress can be very detrimental indeed. Raising awareness of this and giving people the skills to cope better is not just a nice idea but, in my opinion, is the duty of any good workplace. What do you think about Theresa May’s pledge to end mental health stigma voiced this week? It’s great to hear. It’s really the final frontier of medicine that we need to crack. So many people struggle on feeling lonely, isolated, unsupported, lost and unable to cope. This must change. How regularly do you see wellbeing approaches effectively integrated into businesses? Many companies I visit have truly inspiring wellbeing programs in place for their staff. It’s great to see them and there is always a palpable difference in the mood and attitude of the workers in those companies when compared to places with no such programs. Talks and activities can all help staff with good intentions to actually turn those intentions into actions and the company will reap the benefits of healthier and happier staff. To what extent does culture and engagement play a part in the success of a wellbeing programme? Like with most things you need to want to do something to really gain most benefits. Being made to, or doing it just because everyone else is, is not ideal. Clearly the cultural ideation of the company and staff play a big part in how much people want to take part or not, and how acceptable it is to do so. What role do you think wellbeing will play in transforming employees health and culture in UK businesses in 2017? I think this will become more and more of an important area of focus for companies this year, and in the future. Those that have already done so have seen creativity, positivity and output improve in their staff and so it really isn’t hard to appreciate the importance of providing employees with health and wellbeing support. There are many resources available to HR departments to help do this but one thing I do often see overlooked is this: these support programs apply to HR departments too! So often I see HR staff busy organising wellbeing programs for company staff without taking part themselves. Lead by example!